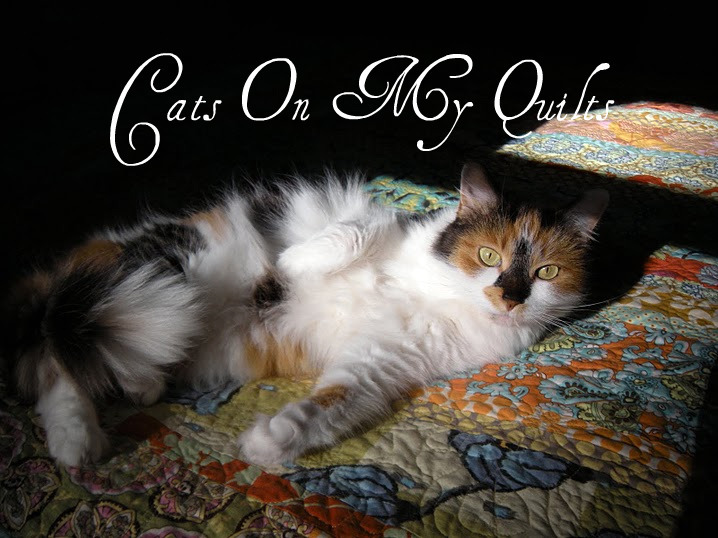 Cats On My Quilts: Have you Schnibbled? Just a quick check in here. 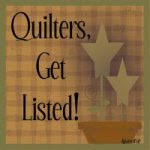 One of my Schnibble quilts is being features here at the Martingale Blog so check it out. Mine is the Imagine quilt which is #3 in the slide show. I really haven't fallen off the face of the earth here in NH. I just completed two quilts that will be going at our lake camp so I am sewing. It's been so dark here this week that I haven't gotten a good picture of my quilts so I will take a picture this weekend for sure. This is where we have increasingly been, at our camp, getting it ready for summer. We had a new dock put in as the old one was falling apart. Just need to get the motor and sail boats in the water. This lake is actually drained down 6 feet every winter to allow for the snow melt. The problem is that this winter we had virtually no snow, so there is no snow melt. The water level is coming up slowly but so far it's still too low for boats. It rained all week so that should help. And one more note. A year and a half ago I found out that I have a serious illness that involves my pancreas (cysts) and stomach (cancerous tumors). I have since had 5 MRI's, 2 CAT scans, tumor removal and several biopsies, 5 Endoscopic Ultrasounds and many, many doctor's appointments. April was a month that I had a lot of these appointments but I had my final one today for now with my fantastic surgeon at Massachusetts General Hospital and she declared that I (as in my innards) am "looking pretty darn good"! So that was good to hear and I am now looking forward to summer. Next MRI is in July. I may at some point have to have part of my pancreas removed but I'll deal with that when it comes along. For now bring on summer! 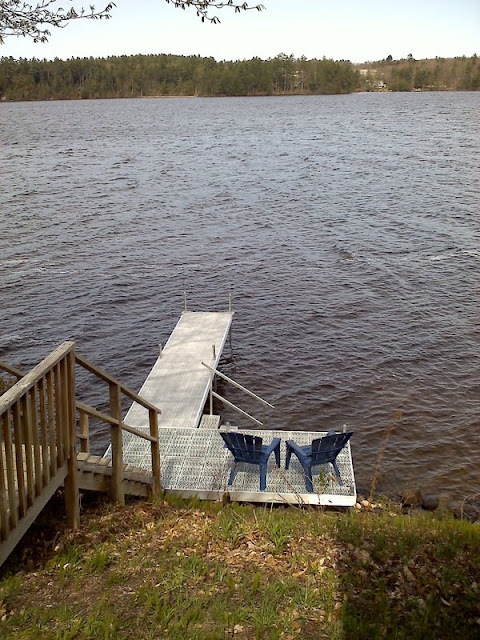 That looks like a good sturdy dock. Too bad we can't send you some rain. The poor tsunami hit area got way too much this week and some of the evacuation housing is flooded. Prayers are flying your way for your recovery. Nice that you got one of your fabulous schnibbles quilt featured! That waterfront looks more and more inviting every day. Have I Schnibbled? Well, if making string and crumb blocks count. The description said scraps :) Guess I'll have to find a real Schnibbles pattern- LOL. Gosh, I'm a new follower, did not know of your illness. I'll pray for your recovery. BTW- your quilt at the link is just so pretty! Hallelujah for the last appointment. That was a big day for me a few years ago. Now I'm down to once a year with 3 dr's and that's doable. Your cabin view looks amazing, I'm thinking the same thing, Summer, bring it on! I saw your Schnibble!! I didn't know what 'schnibble' meant until i went to see your quilt and read the post! ;-) Yours is pretty! Sorry to hear you've been going through so much with your health. Get a book and sit out on your new dock and enjoy the beauty. Prayers for you! I am so glad to hear that you got a good report from your doctor. Enjoy your summer to the max! Good heavens, you have had your hands full. Sending prayers that things continue to look pretty darn good! HI Chris Love your schnibble quilt I love the way you can see different designs in it. Sending up good thoughts your way and I sent u an email to the gmail address. Glad to hear your good news! Enjoy the summer.